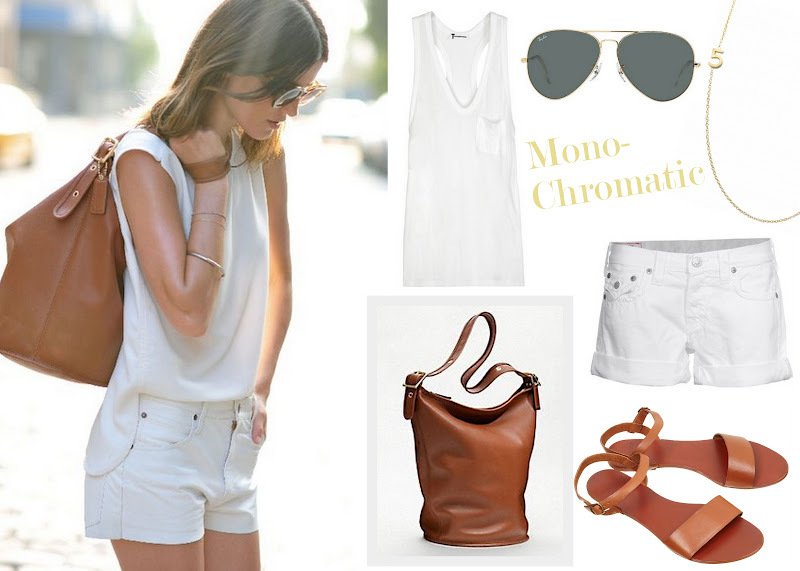 If Winter dressing is all about black, then Summer dressing is all about white! Keep it simple and effortless - I definitely abide by the 'Less is More' when the temps heat up! And you can sure bet I will be pulling a Copy-Cat out on this one! I mean really how could you not?! Farmers markets to al fresco dinners. To vacations abroad to grilling in the backyard - this look will go the distance! You could even DIY your own white denim shorts with some old jeans!!! Man why did I just get rid of my old pair?!?!?! agree...Hanneli's whole look is PERFECTION!! Love this look, especially the bag and flats. Definitely one that would work all throughout summer. I love this! And as much as I'm embracing color this summer, this color combo is very chic! I need those shorts and the duffel and the sandals. Omg. I'm going to be thinking of that purse all day! this looks perfect! great styling! I love white in the summer (as long as I have a tide to go pen - I always spill something!) love the sandals too! GAH!! Why have I never thought of DIY my white jeans into white jean shorts? You are my hero. "Thank you, thank you, thank you, thank you," say both my closet and my wallet. This is so soothing. I think I need to nab those sandals and maybe a bag like the Coach one. I'm not really a fan of their brand, but maybe I'm coming around! It's wonderful. Easy, breezy and so very pretty.